13 ILLINOIS PUBLIC OFFICIALS INDICTED INCLUDING REV. WRIGHT’S DAUGHTER!! Thirteen members of Illinois’ powerful and elite political class have now been charged in fraud schemes by the U.S. Attorney’s office this year. 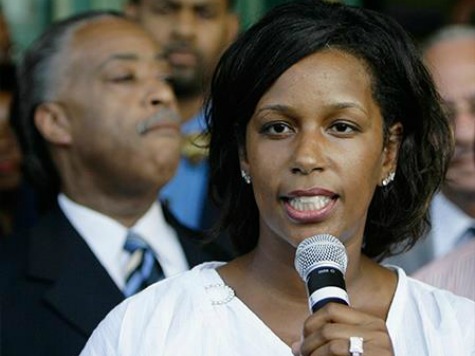 At least two have some form of connection to President Obama: Jeri L. Wright, daughter of the controversial Reverend Jeremiah Wright whose church Obama attended; and Quinshaunta R. Golden, former Department of Public Health chief of staff to President Obama’s longtime friend Eric E. Whitaker. Golden is also the niece of U.S. Congressman Danny K. Davis (D-IL). The Chicago Sun-Times has compiled a run-down of all 13 cases filed so far. The charges range from money laundering, mail fraud, wire fraud, conspiracy, obstruction of justice, and witness tampering. The charges revolve around the fraudulent use of state health and commerce department grants and contracts. Six of the 13 accused have already pleaded guilty and are scheduled to be sentenced in October and November. The remaining seven, including Wright’s daughter and Davis’s niece, have trials set through the beginning of December. Golden is accused of “pocketing about $433,000 in kickbacks on health department contracts and grants that she oversaw. Her boss at the time, Obama’s friend Whitaker, has said he is cooperating with the investigation.” The Times reports Whitaker “had no first hand knowledge” of the alleged activities. Please Pray they Catch Evil Obama NOW, because he is part of this and so is his Evil Friend Jeremiah Wright!!!! Please God Bless The United States Of America again! Christian’s all over the USA NEED TO FIGHT for Our RIGHTS on the Constitution and Bill Of Rights are being taken away from us! Let me ask Everyone this, Do You Want and Islamic Nation in the USA? I Want the USA to Get Back to Jesus Christ again, He is King of kings, and Lord of lords! Jesus is our Holy Father in Heaven! Are You Ready, Jesus is Coming back again Soon!!! « Point of Grace – “Only Jesus”! !